New data collected by the Juno spacecraft that was sent to study Jupiter has made it possible to hear what it's like to leave the sun’s space and enter the planet’s magnetic field. 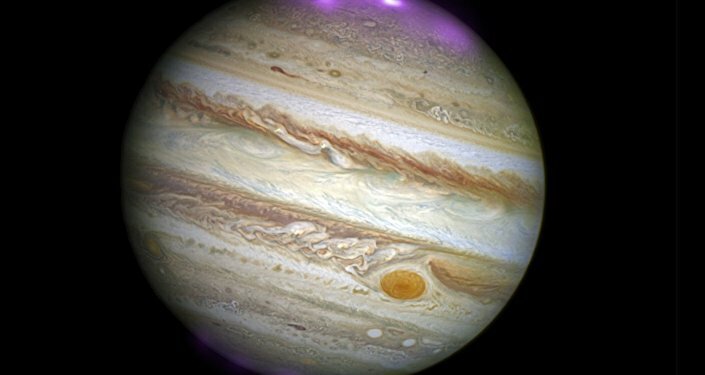 Besides Jupiter's stunning light show that astronomers were able to witness with the help of the Hubble Telescope, the actual sounds that the planet's environment makes have been captured by Juno spacecraft on its way to Jupiter on June 24. — NASA's Juno Mission (@NASAJuno) 30 июня 2016 г. ​New videos released by NASA use data collected by the spacecraft about the space environment 5.56 million miles from Jupiter to create sound files. The high-tech transformation lets us literally hear the exact moment Juno entered Jupiter's territory. "We can actually listen to what it's like to leave the sun and enter Jupiter," Juno principal investigator Scott Bolton said during a news conference on Thursday. The sounds are what is known as a bow shock. "The bow shock is analogous to a sonic boom," William Kurth of the University of Iowa in Iowa City, lead co-investigator for the Waves investigation, said in the NASA statement. "The solar wind blows past all the planets at a speed of about a million miles per hour, and where it hits an obstacle, there's all this turbulence." In this case, the obstacle is Jupiter's magnetosphere, the invisible border that separates the planet's magnetic part of space from the sun's. "If Jupiter's magnetosphere glowed in visible light, it would be twice the size of the full moon as seen from Earth," Kurth added.